Herlooo Dearest Sweeties♥ :) How are you today?! I'm so sad because this week I'm gonna prepare for my intern and next week Monday I start my intern already :'( Will start my very first working life which need to wake up every weekday and only able to rest on weekend. OMG God bless me and I'm really so happy on this few weeks because I meet lots of new friends , joined lots of events and the most happy moment is I'm able to share it here with all of you. Miss me please. Stop Crapping here. So yea♥ I join this Elianto Blogger gathering with others blogger on last week and it was a tiring day because I went two event on the same day. Lol It was a wonderful time because I spent my day with all my new friends and at the same time was trying to ignore or should I say escape from something I don't like. This Elianto's Blogger Gathering♥is on 23rd May (Thursday) @ Delicious, Dua Residency. This wasn't the first time I join event at Dua Residency :P I remember previously the Petronas Appreciation Party was held on the same venue too. All product arrange nicely on the table and we can just simply try it on our hand and also experience it. Above is the new range , Lumino White series♥while the photo below is the STAR of the day , CC cream♥! 1 hour later after the registration done , Elianto start to introduce us about their new range skin care product and the CC cream. It was so blur at first... because we don't know anything about the new series but don't worry I will be here to share every detail and information I get during the gathering k? They actually make the gathering to be more interesting and show us some demo on how to use it. Chenelle♥ is the Model of the day & I think without anything on her face she still look very pretty!!! 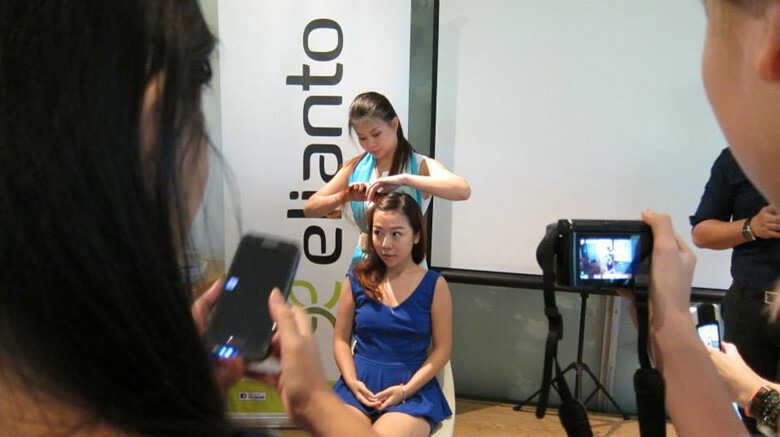 A short speech arrange by Elianto before the beauty trainer, Jane start to brief us about all the new product from Elianto. What is Lumino White? It's a whitening product ? How about it's benefits? Can it moisture our face? How can it help me to achieve my desirable flawless skin ? Let me began with the introduction of Lumino White series. Lumino White series is a brand new series product from Elianto and it's so special because it results with the latest scientific breakthroughs to develop a 6 DIMENSIONAL♥approach which can helps in achieving a flawless and translucent complexion. I know you will say that maybe you're not suitable on whitening series but this Lumino White not just for whitening,it also help in moisturizing your skin. So it's suitable for those who want to achieve both whitening and moisturizing too. Jane told us that some other brand product on whitening series is not even moisturizing your face and that's why this new series Lumino White appear :P I think the 6 unique selling point on this new series is damn attractive♥. Besides on whitening and moisturizing , it also help us in preventing pigmentation , de stress , reduce melanin production and also straighten our skin barrier. 4 FREE This lumino white series have another 4 unique selling point which is Paraben Free, Phthalates Free, SLS&SLES Free & last but not least ,Petrochemical Free! Those ingredient is bad and hurt on our skin but Lumino White didn't included it as a part of their ingredient inside this series. 2 main ingredients in this Lumino White series - Sand Lily & Vitamin PP. Sand Lily is one of the most beautiful wild Cretan Flowers which can be found on the northern beaches of Chania. It mainly help in reduce the size & the pigmentation of dark spot. Beside of the whitening kind of benefits, Sand Lily help to improve uneven skin tone too. HAHAH This is the first time I heard on this kind of vitamin but it's actually known as Vitamin B3. It works almost like sand lily but it brighten the skin and fade away age spots and protect the skin, keep it well hydrate for many hours , reduce the sign of ageing and lastly control skin blemishes. So it's actually the same step as your daily skin routine , just that the Dairy Protector use on the day basis while the night cream use at night. First experienced on their product it's kind of hydrating but the absorption is a bit slower than I thought. Due the the slow absorption I can feel it a bit sticky on my hand but after few mins I feel fresh on my skin and I didn't feel dry at all. The cleanser of this series is not like those bubble foam but you can really feel that it gently cleansing your skin. Other than that I think their CC cream impressed me too! Oh yea♥! CC cream also known as Correction Complete Cream . It's almost like a BB cream but this can correct your uneven skin tone at the same time with the micro-coloured capsules it can create a dramatic effect on your skin giving you a desirable radiant look , INSTANTLY. Elianto have two diff cc cream and I guess it's useful because the daily protector in the lumino white series just has SPF 20 which isn't enough for us. So I'm looking forward on this CC cream which has a SPF40/PA+++ and for me I think it slightly better than the daily protector due to the high SPF protection. The first CC cream is the Amazing White CC cream -Whitening and another one will be the Infinity Youth CC cream- Anti-aging. For me I prefer the Amazing White CC cream :P Most suitable for our age I think. 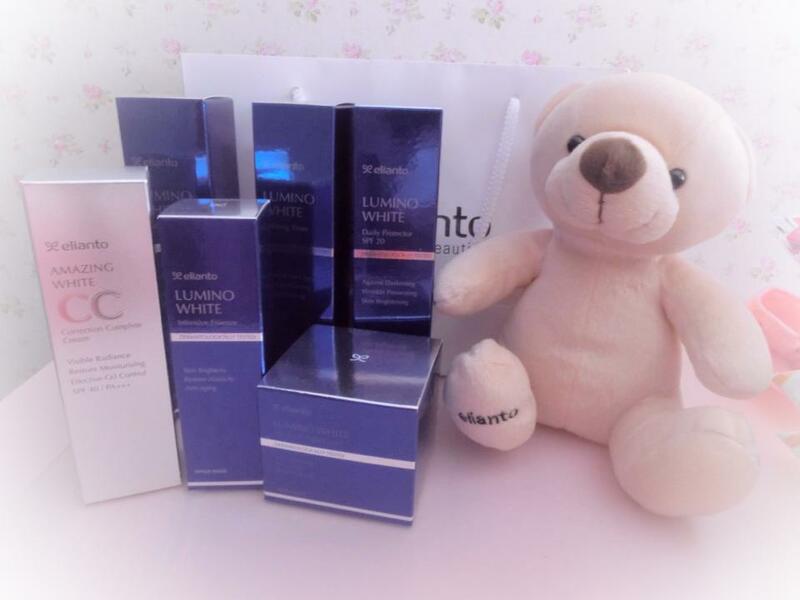 Thanks Elianto for whole set Lumino White skin care product and of course my favourite CC cream :) Thanksssss for everything♥♥! Love, xoxo.